Will the Bianconeri sacrifice Dybala for the starlet? 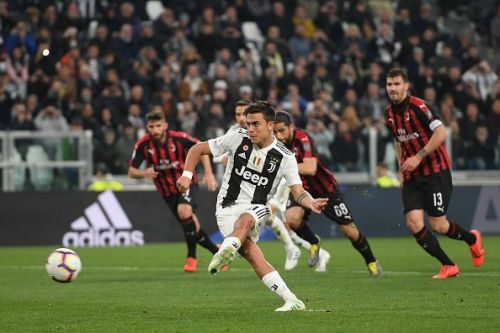 Juventus are ready to sell under-fire Paulo Dybala to fund a move for Joao Felix, according to a report. The 19-year-old starlet has been heavily linked with the Old Lady following his sensational display for Benfica this season. Felix has been dubbed as the 'new Cristiano Ronaldo' as he continues his scintillating form in the Europa League. The Portuguese starlet netted a hattrick and an assist against Eintracht Frankfurt. He also scored a goal and provided 2 assists against Vitoria Setubal in his latest domestic league match. Benfica, however, would demand at least €100 million for the Portuguese revelation according to the report. Joao Felix has expressed his interest to play alongside Cristiano Ronaldo in an interview earlier this year which further fuels the surrounding speculations. Juventus have reportedly approached Real Madrid for Raphael Varane. Unfortunately, Real Madrid are responding negatively and said that the Old Lady need to pay Varane's ridiculous €500 million release clause if they want him. The clause is surely absurd for any team as it will break Neymar's transfer record if triggered. It is understandable that Matthijs De Ligt is close to a move to Barcelona. Hence, Juventus should look for another defender to rejuvenate their aging backline. The Real Madrid defender is one of their top targets for defensive reinforcements. However, the transfer of Varane would not be possible for the Old Lady as things currently stand. Atalanta head coach Gian Piero Gasperini stated that Papu Gomez has what it takes to play for Barcelona. The Argentinian midfielder has impressed in Serie A so far as he has scored 6 goals and provided 9 assists. "Papu Gomez is a team man, now he could play for Barcelona. Ilicic was practically at Sampdoria, but I convinced him to come here. Duvan Zapata? He always has problems at the beginning of the season because in Colombia he lives at 2 thousand meters of altitude," Gasperini said. The manager was also aiming praise to his former player Leonardo Spinazzola and talked about Napoli President Aurelio de Laurentiis. "What a satisfaction to see our Spinazzola flying on the wing against Atletico Madrid in the Champions League. The three-man defense is a rematch for me, as did Arsenal in the Europa League against Napoli. Eight years ago President De Laurentiis came to my house, asked me to offer him an espresso, but I'm not capable and told him to do it himself. What a laugh. Then he finally confirmed Mazzarri."